The Upbeat Dad! : Making Hay While the Sun Shines! I can’t believe that we have less than a week left in year. Where did the time go? And doesn’t it just seem like a year or two ago that we were talking about the New Millennium and Y2K and the related possible technological issues? Yep, time does fly, especially when you’re having fun. I was just thinking about our roles as dads and moms. Our kids grow up so fast don’t they? Our daughter was just a baby in my arms a couple of years ago – but now she’s 12. I remember I used to hold her in one hand like a football. Now she’s a young lady, almost fully grown. She sends text messages and has her group of friends that she hangs out with at school and at church. We also have a 4 ½ month old son and he’s a joy and a wonder. In the few months of his life so far, there are so many stages that he’s passed through already. First he was just a newborn who did not even know how to feed. Then he learned that. Along the way, we’ve seen him learn how to smile. And then laugh. He’s trying to move his limbs now, getting them ready so that in a short while he can begin creeping. Before long, he’ll begin walking, then talking. All of this is about going through the natural stages of life. In the midst of all the changes that our kids go through, it can be so easy to miss the different stages. Even our son’s features today are not what they were a month or two ago. If we hadn’t captured each stage by either photograph or videocamera, we probably wouldn’t even notice these changes. My mother taught me the proverb, “Make hay while the sun shines.” In other words, take advantage of the opportunities you have while you have them because they won’t always be available to you. With our children, if we don’t give them the basic guidance from their early stages, then we can really miss out on opportunities to give them what they need to succeed in life. Another proverb that I learned is, “Train up a child in the way he should go; and when he is old, he will not depart from it.” That is quite profound and so true. Our daughter is 12 years old now and in the 7th grade. In another few years, she’ll be college bound and after that she’ll be legally an adult. And though we can teach and guide her in adulthood, it’s much better to provide this guidance while she is young so that it becomes a way of life for her. As I have stated on a number of posts including The Story Behind The Upbeat Dad, I have a passion for families in general, but especially those that are affected by divorce. I particularly have a burden for the children that are products of these broken homes that result when families fall apart. One of my concerns is that too many fathers are absent in their kids’ lives. Some are involved but as soon as the marriages and other relationships end, they decide to also give up on their roles as fathers. The absentee father syndrome is an epidemic. A couple of months ago I spoke to a group of 4th and 5th graders and after my presentation I had a discussion with one of their teachers. He told me that none – not even one – of the kids that I spoke with has a father living in the home. And furthermore, very many of them don’t even know who their father is. I cannot imagine my son and daughter growing up and going through their different stages and phases and I voluntarily make myself absent from their lives. Yet, that is a way of life for millions of fathers. 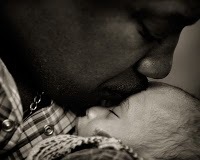 While I recognize that some fathers may be negative influences on their kids, the vast majority of them can have a positive impact if they’d only be involved. But all too often, they make the decision to be absentee fathers and that’s so unfortunate. I recognize that the family law system can be unjust. I have written blog posts about that – such as The Great Oxymoron: Family Law and What Exactly is Child Support? I also recognize that in many cases, the mothers of our children can be difficult to deal with. But as difficult as it may be to deal with those forces, our kids are not at fault so they shouldn’t suffer. When we take responsibility for the well-being of our kids, then any obstacle that we face can, at best, be temporary. Millions of fathers all over the world are missing out on their kids' lives. I really do hope that through this blog and my organization, I can help to serve as an agent of change in their mindset. I know what it’s like to go through a divorce and have a young child caught in the middle of that unpleasant process. I also know what it’s like to feel as if the system is designed to function against me. Yet today our daughter is a wonderful, well-adjusted 12 year old on her way to doing great things. She has two parents who love her and are actively involved in her life. I’m fortunate to have married again and have another child. And I’m very fortunate that my daughter and her step-mother, my wife, get along just great. Many readers of this blog are men but consistently as I review the statistics on a daily basis, 60% of our readers are women. I’m truly thankful that the content of the message I share appeals to both genders because my goal is to impact the lives of our children as a result of them having loving, involved dads. Men, women and kids all benefit when fathers are involved. I hope that you understand why I write as I do. This matter is of extreme importance to me. The great institution of the family is in crisis and a large part of that has to do with fathers neglecting their very important roles. Please join me in this campaign to have more upbeat dads and less deadbeats. If you haven't already done so, please join us on Facebook and follow us on Twitter. We’re looking for a few good men to step up and accept, with great enthusiasm, their role as dads, not simply biological fathers. Gentlemen, let’s live our lives in such a way that our sons would want to be like us and our daughters would want to marry men with our qualities. To our female readers I say, hang in there. We’re working on something big here. And I feel certain that our kids will benefit from our efforts. Our kids won’t be young forever. Let’s make hay while the sun shines.